Corporation is a complete cyberpunk role-playing game written by James Norbury and published by Brutal Games. 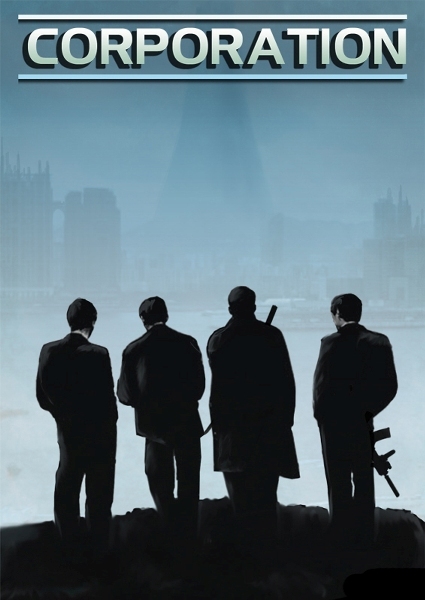 Corporation is the penultimate, near-future, science fiction system and setting. The setting is alluring, backed by a system that is simple yet powerful. The dystopian dawn of the 26th Century is rife with opportunity as Agents don their Cybernetics and take to the streets in a seemingly never-ending conflict between the powers of the world. Corporation is a 2d10, roll-under system where target numbers are based on the sum of a character’s corresponding Stat and Skill. Thus, as a character’s Stat or Skill increases, the chances of succeeding increase. The target number is modified, as would be expected, by difficulty and to perform the really difficult tasks, one has to modify themselves using cybernetics. To better embrace the concept of CYBERpunk, Corporation does not allow Stats or Skills to be raised over 10 without using cybernetics. This is a cool form of balancing and a really cool way of supporting the game’s overall theme. The basic mechanics of the system have a very familiar feel for regular roleplayers and a not-too-complicated design for the newbies. However, its the setting that truly shines in Corporation, and what really draws me in to the game. Introduction to Corporation gives the reader the basic introduction to the game system and setting including a brief look at the world in 2500, what it means to be an agent, and the standard load-out that every player character receives. Character Creation is exactly what it says. However, be aware that in Corporation, agents are more than just player characters, they are agents of one of the major corporations conforming to what their employers desire (such is this style of cyberpunk). Upon creating a character concept, it is pertinent to find the corporation that matches that character concept. You could try to shoehorn something in, but it may break the synergy of the setting. Once the concept is created, Character Creation moves to descriptions of the available skills, non-combat training, combat training, licenses (you will need a license to do all that special stuff), and wages. Equipment is where you outfit your agent with everything they need for missions including weapons, ammunition, armour, shields, toxins and drugs, general equipment, enhancement chips, and vehicles. Cybernetics is the really cool stuff the agents can use to enhance themselves. (Hey, it’s cyberpunk!) Cybernetics is a very detailed look at all the options available from the different manufacturers (listed by manufacturer which deal with different groupings of cybernetics). There is a TON of cool stuff here. Telepathics is actually a very short section. It provides the most basic telepathic abilities and possibly those that would be the most common. Character Advancement deals with the rewards given to the agents through performing missions and a look at how those agents improve their Stats and Skills. This section takes a look at rank, experience points, agent level, mission pay, and what to do during downtime. The Corporations is one of the most important sections to read as it details what has brought the world to its current state along with providing crucial background information for the different corporations. The UIG & The Order of the True Faith is much like The Corporations and details the UIG (think really big brother) and The Order of the True Faith (this one is too cool to spoil). The Game System in my opinion should come much earlier in the book or should be summarized in the first 10 pages. Regardless, it details the Brutal Engine (the game system that powers Corporation) and includes all the standard mechanics along with those for vehicle use and hacking. The World in 2500 is the another of the most important sections to read as it tells all about the ins and outs of the world in Corporation. This includes communication systems, money, travelling, food, computers and AI, and crime. The Cities & People and Places are two sections that provide additional setting detail including a listing of content the Game Master can incorporate into their adventures and campaigns. This is good background material for players, but the Game Master may choose to keep much of it under their belt for surprises during a campaign. Running a Game is not just another list of tips and tactics for the Game Master. It is actually a set of toolkits and sample mission overviews for quick incorporation into an adventure or campaign or to serve as a guide for the Game Master. Players should keep their noses out of this section to avoid spoiling anything! Antagonists is a list of adversaries covering the gambit of corporate agents, humans, UIG soldiers, outlaws, thugs, and lots of other things you can imagine. It’s not so much as the ultimate guide to adversaries as it is a guide to what types of adversaries are the most common and a look at how they are statted from rank to rank and level to level. There’s no denying that I find Corporation to be a fantastic cyberpunk game. Maybe it’s the setting, or maybe it’s the simple yet flexible system, or maybe it’s the synergy between the two. The fact is, when I read through this book, I can imagine the world as they describe and see the agents running around doing those deeds that are meant to be kept “off the books.” Additionally, the core rulebook is packed with just the right amount of content to get everyone started while leaving the door open for additional source material. This is a must have for fans of sci-fi action and adventure, especially for those who like to run in a dystopian near-future. Corporation is a clean, high-quality, professional book from a small publisher. There are little things here and there such as the layout lacking consistency to save space and some of the black-and-white illustrations being a little too dark, but nothing that keeps it from being a great-looking book. The formatting is extremely easy to read and the layout makes the content easy to follow. I did have to skip ahead and read the first few pages of The Game System to properly understand everything prior to that section, but was able to understand everything after only reading the basics of the system. I would prefer to see a quick overview of the system prior to character creation, but this layout is quite common across all game systems. I love the simplicity and flexibility of the Corporation mechanics (powered by the Brutal Engine). The Brutal Engine is not overly-simple nor is it overly-complicated providing a good middle-ground often seen in some of the most popular game systems. 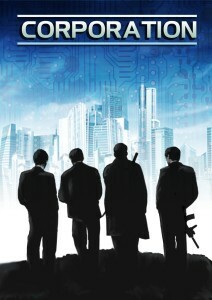 However, what really makes the game’s mechanics stand-out is the way it embraces the cyberpunk and corporate agent themes through the use of licenses (you need a license to pretty much do anything other than sitting in a chair and rocking), mechanics for telepathy, cybernetics, and how the different corporations provide different options for their agents. There is a lot of synergy between the mechanics and the setting. Corporation really embraces the cyberpunk genre and the concept of near-future science fiction. There is an immense amount of room between the extremes as far as adventure and campaign themes running from you vs. the world, corporation vs. corporation, corporation vs. the government, and you can even travel outside of Earth and place your campaigns on Mars. You’re not going to run a game that spans the galaxy or interface with a bunch of invading aliens by hopping into your tank and blowing them out of the sky, but that’s not what cyberpunk is about. Corporation is an awesome sci-fi action and adventure game with a rich system that is easy to immerse yourself in. So why would someone want to play it? Because the system and setting provide a wide range of opportunities and options for all types of sci-fi/cyberpunk action and adventure campaigns. Its hard to describe what makes Corporation such a great setting. Its easy to talk about the system, but the synergy between the two is what really makes it such a great game. In addition, there is just enough content to play an entire campaign without needing supplements. But there’s more than enough room to expand upon the given content to create considerably different campaigns with more focused content concerning the different corporations. So what you get in the core rulebook is a terrific system with an immersive setting and lots of opportunities for excellent adventures and campaigns. If you’re looking for an awesome near-future sci-fi experience, there’s no reason to look further than Corporation. It should be noted that the book I reviewed is the hardcover originally published through Mongoose Publishing’s Flaming Cobra imprint.